Of course the later FASM v1.71.48 is inside. AsmEdit control has been edited in order to provide better performance in WINE (some WINE bugs have been circumvented and refresh mechanism cleaned). The examples and the new application templates have been updated in accordance with the later changes in FreshLib - now everything compiles properly. Also several minor bugs have been fixed here and there and probably fresh new introduced. The whole history of the source code is, as always, in the repository. Have a great coding with Fresh IDE! Hey! In Ubuntu 14.04 with WINE multiple windows/panels of Fresh IDE overlaps each other, the properties window is too long at startup. So every time I start the IDE I have to place/size all this panels properly to fit the screen. Can Fresh has just one window with panels instead? P.S. Interesting examples, sqlite example is my favourite one. Can you post some screenshots? I never tested it with Ubuntu. Try "Window|Auto arange windows". It is almost impossible to make Fresh single window application. Several attempts has been made. But Fresh 3.0 will be rewritten from scratch, so you simply have to wait a little. Ok, then. Here is the screenshot. It is really very strange. 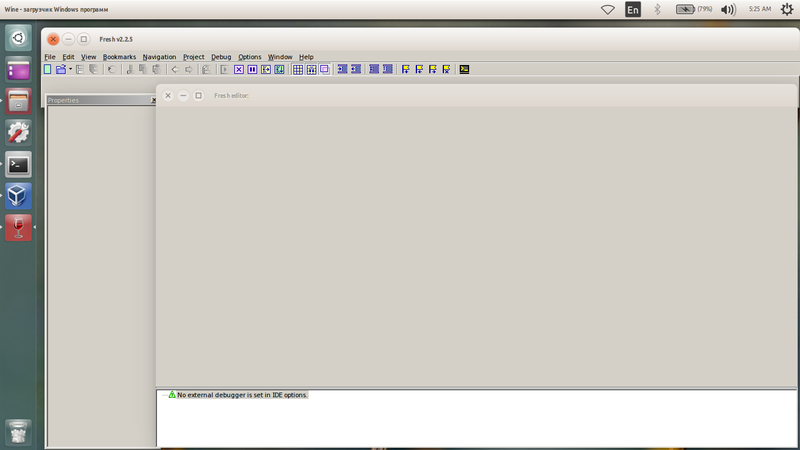 Seems that the window manager of Ubuntu behaves somehow weird. Try to switch off the option "Graphics|Allow the window manager to decorate the windows" in winecft options. BTW, what version of WINE you are using? When I tried to switch off that option windows style became like in Windows 2000, but everything else left as it was. Sorry for this inconvenience. I will see what I can do about this problem, but it will need installing of Ubuntu and testing, so I will need some time. It's ok. I just wanted to make you know about it, so that you can make the IDE a little more usable. Being new to "professional ASM" (I mostly work with C++ these days), I thought I'd give FASM/Fresh a shot as it seems to be a viable starting point for beginners. Here are a couple of thoughts in case you care. Preface: I use Windows 10, x64, meaning that FreshLib doesn't work for me, but I can wait. The startup time is plain awesome. I tried EasyCode before but it was horribly slow. I'm not a fan of wasting seconds. I really like the Delphi'esque design. (That might be a matter of taste though.) I miss the old Delphis. The toolbar icons could be a bit more modern though. 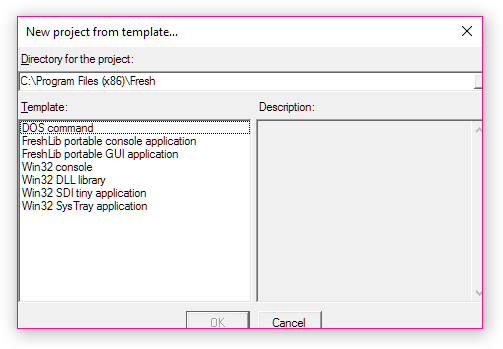 Fresh does not seem to remember my project directory which is especially bad on Windows 10: The installer installs to %PROGRAMFILES(x86)%\Fresh, so the default project directory is also set to this directory but Fresh can't write there because Windows 10 does not really want people to store their stuff into the Program Files anymore which makes sense. That results in "Error: Write failed" when just trying to start a new project with the default settings. The "New project" window seems to have alignment issues. See the attachment. But you are right that the directory management needs some development. Problems with Windows 10 has been reported already, but unfortunately I simply don't have Windows 10 installed and this way, the bugfixes for Win 10 will come slowly. The control alignment issues are probably because of the visual theme. As a work around and additional test you can try to switch to "Classic theme" if it is available in Windows 10. I will try to fix these and some other problems, but can't promise how quick it will happen. Sadly, Windows 10 does not have a Classic Theme anymore, so I'm (more or less) stuck with what you see. AFAIR Microsoft had already removed it with Windows 8. I can wait - I'm always here to test for you if needed. So, welcome on board. I am glad you are here to stay.